My wife is out of town this week. When I'm home alone, I find myself more willing to work late into the evening with projects and activities, because I know I'm not missing out on important family time. When solo, I'd much rather stay out on a long bike ride or keep progressing on a woodworking project until bedtime than just sit by myself on the sofa. So, such was the case when I found myself with a free evening. I didn't get started until 6:00pm or so, but knowing I had nowhere else to be and plenty of leftovers in the fridge, I set out to complete some shop storage projects for the wall just to the right of my bench. I'd been saving those blank spaces for nearly a year (you can find the clamp rack tutorials here, here, and here), reserving them for a special set of Woodpeckers straight edges and squares. 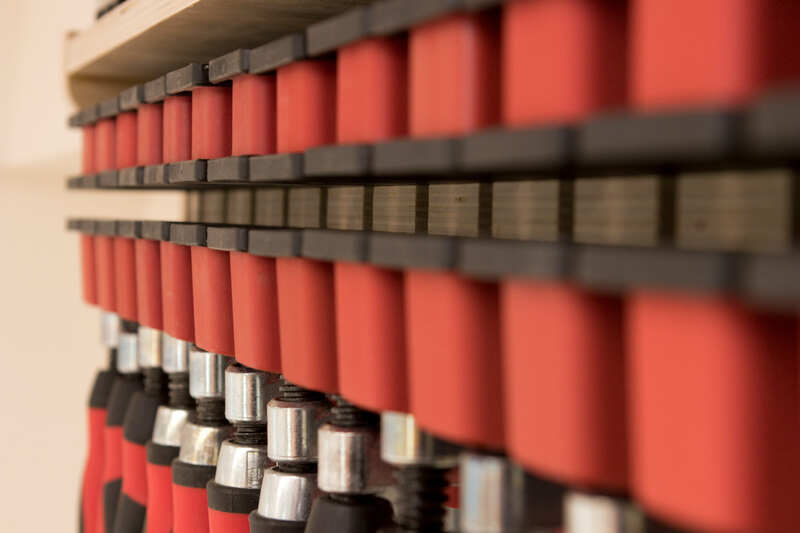 These things are machined to extremely low tolerances, making them crazy straight and square, so making a secure place to store them helps them to stay precise. Plus, the red color matches the handles and jaws of my Bessey clamps, so combining the two was a total no brainer. I have tried almost every solution to keep track of my hand screws. I've hung them on pegboard hooks. I've stashed them in wall-hung cubbies. I've stacked them on shelves. I've put them in designated plastic totes. All of which have resulted in: I hardly ever use my hand screws. Which is a shame, because they're extremely versatile. They have a deep reach, and their wooden jaws are handy when you don't want to nick a blade or bit on something metal. 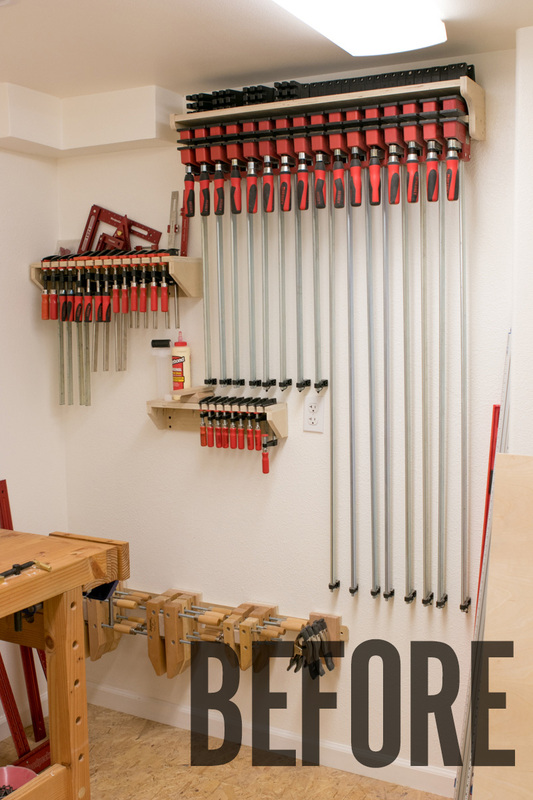 So, last weekend, in my ever-continuing attempts to get my shop truly organized, I decided to build a wall-mounted hand screw organizer that would allow me to keep things in place and bring the clamps to the project when I need them. A functioning clamp rack. Every shop's gotta have one. "But, wait!" You say. 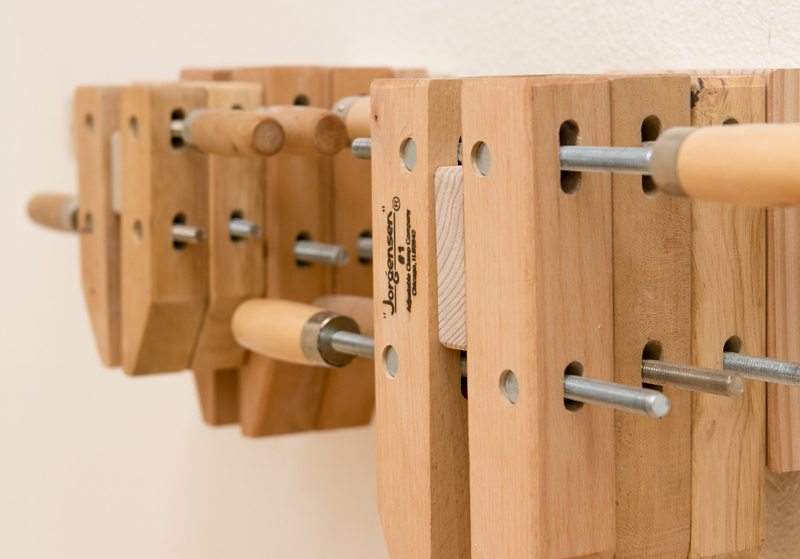 "Isn't the easiest way to hold clamps just some 2x4s bolted to the walls, and maybe some holes and plumbing pipe inserted to hang the clamps on?" Yeah, perhaps. But, while that works if you have a ton of space, it's not the most efficient way to store clamps in a small shop. And I think of that as more of a "clamp hanging spot" than a proper organization system. Plus, if you already know about that trick, you certainly don't need me to give you a how-to. Instead, I present this clamp rack design: infinitely adaptable to any scale, and able to hold almost any type of clamp. You can build the whole thing with some scrap plywood, a jigsaw, and drill, and make one - no matter the size - in well under an hour. Whenever you're working on a bigger woodworking project that involves milling and preparing stock for parts, you often have to work on several parts at once in order to maximize efficiency. For example: dimension, plane, and joint all the wood at once while the tools are set up, cut all the joinery while the dado stack is installed in the table saw, etc. Each week in 2015, ManMade is sharing our picks for the essential tools we think every creative guy and DIYer needs. We've selected useful, long-lasting tools to help you accomplish a variety of projects, solve problems, and live a hands-on lifestyle that allows you to interact with and make the things you use every day. 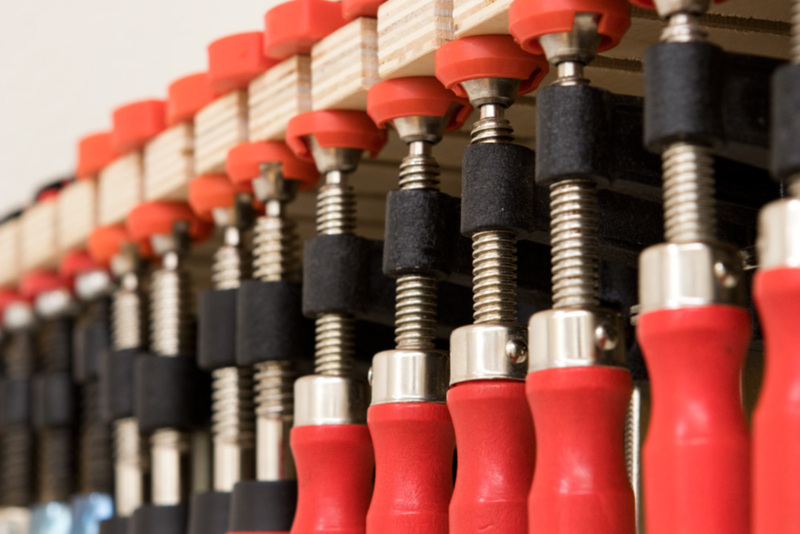 Last week we talked about the 5 essential small clamps every DIYer should own. The post was an overview of the various clamps we use on just about every project. 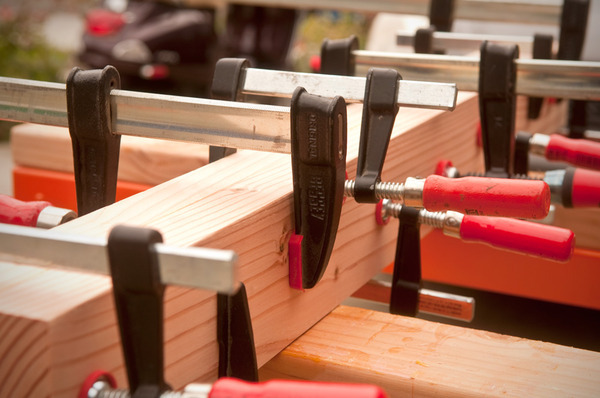 Today, we're going to focus on which clamps we grab for the large glue-ups where holding pressure and stability are important for a flat and solid glue-joint.